While working as a patent attorney, Dr. Karmali had a client with a promising therapeutic for multiple cancerous indications. The client was interested in evaluating the therapy for prostate cancer and, due to her training in cancer research, Dr. Karmali decided to test the drug against a similar therapy, CAI-L651582, in development at Merck. During the studies, she found that forming a salt of CAI and orotic acid would in fact improve CAI’s bioavailability and tolerability. The new compound Dr. Karmali produced was CTO. She patented, and eventually bought, the technology. She then founded TTI to bring this potent anti-cancer compound to patients in dire need of new brain cancer therapies. CTO maintained the remarkable anticancer properties of CAI, but had drastically lower toxicity as compared to the original compound. CAI-L651582 was never approved by the FDA, as it was found to have unacceptable toxicity in as many as 16 clinical trials. CTO is a novel, orally administered, small molecule that inhibits angiogenesis and tumor cell proliferation by addressing multiple pathways, thereby circumventing resistance in brain cancer. Carboxyamidotriazole orotate (CTO) is the Orotic Acid salt of 5-amino-1-(4-(4-chlorobenzoyl)-3,5-dichlorobenzyl)-1,2,3-triazole-4-carboxamide (CAI). TTI’s CAI is synthesized by a different process using different ingredients. This accounts for TTI’s CAI and CTO exhibiting a safer toxicity profile than CAI-L651582. CAI is a voltage-independent calcium signal inhibitor with anti-angiogenic, anti-proliferative, and anti-invasive properties that demonstrated promising efficacy in preclinical and clinical studies. However, hydrophobic properties of CAI caused binding to plasma proteins and poor absorption, resulting in poor bioavailability and efficacy in vivo; CTO has increased bioavailability and reduced toxicity. Orotic acid is a naturally occurring substance in cow’s milk that forms a stable complex with CAI. CTO inhibits multiple oncokinases, including EGFR, MEK, RES, HDAC, HSPQO, WNT/B-catenin, Akt, ERK, VEGF and Bcr-Abl. A pharmacodynamic biomarker for CTO has been developed. 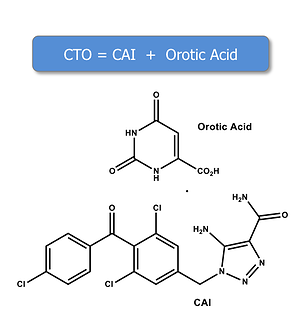 CTO maintains the anticancer properties of CAI while improving upon CAI’s bioavailability and tolerability with the addition of orotic acid. According to KOL primary research, CTO provides an opportunity to address the unmet need in improving survival with a favorable toxicity profile. 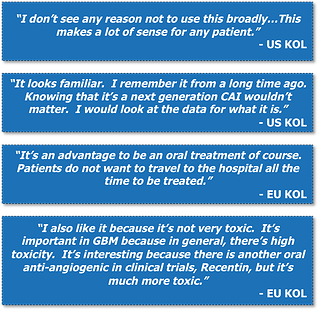 KOLs were highly receptive to an anti-angiogenic that would reduce the significant toxicities associated with Avastin. Convenience of Oral Administration: KOLs noted that an oral formulation was a key advantage for CTO, due to the rapid progression of glioblastoma and patient desire to minimize time spent in the hospital. Based on the product profile presented, leading KOLs believe that CTO represents an attractive treatment alternative for refractory GBM patients.